Thanks for reading my bio. I actually wrote it! You can see my education and experience on this page, but I’m not convinced that my clients care so much about that stuff. Not that those things are irrelevant, but they are pretty boring and tell the client little about my values, personality, or dedication to my law practice.So … I would like to continue with this introduction by making an objection to the traditional BIO format and actually telling folks more about me and the quality of legal representation they can expect. I am a litigator at heart – I don’t suspect I’ll ever get away from arguing with folks about important issues. That’s what I do, and that’s fine, but I also can’t deny my fondness for business, entrepreneurial spirit, and protecting hard earned success. 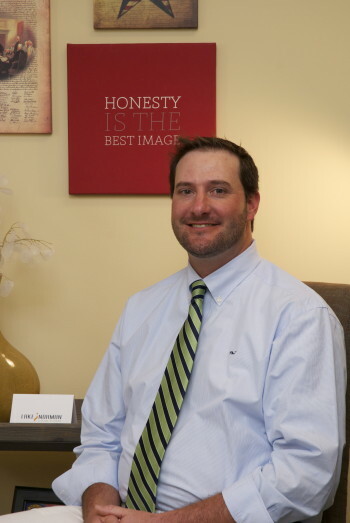 That’s why I started Lake Norman Law Firm – where my legal practice is flexible and catered to serve a variety of Lake Norman area residents. I want to be your go-to lawyer. Whether the issue is arranging a business transaction, a land deal, designing an estate plan, or defending your interests in court – I’m your guy. This doesn’t mean that I have the highest IQ in the area bar. All lawyers are “book smart,” but legal matters require common sense. Smart advice equals VALUE and OPTIONS. At Lake Norman Law Firm, you can trust that your matter will be handled practically and responsibly. If you don’t need a lawyer, I will tell you. If your case stinks, I will tell you. If you do need a lawyer, trust that you will get honest answers, honest billing practices, and truthful expectations. Legal matters are important and serious undertakings. In particular, disputes are very stressful for clients. I acknowledge as much, but this doesn’t mean that you can’t enjoy your relationship with your attorney. I have developed many friendships and long-lasting relationships with my clients. When we need to be serious – we will. But, when dropping by the office, it shouldn’t feel like going to the dentist or to the principal’s office. Lawyers wear ties. In fact, the Lake Norman Law Firm logo incorporates a tie, but not because I wear one all the time (because it’s cool). I promise to go all brooks brothers when I go to court, but otherwise I hope you’ll appreciate the casualness of the office. Would you wear a tie if you didn’t have to? Absolutely, Positively, the number one complaint I receive from “convert clients” is that their lawyer wasn’t responsive and hard to get ahold of. I get this. Attorneys are busy and often juggle a large set of clients. That said, it doesn’t take long to check in with a client and respond to their calls and notes. I try my very best to get back to you within a short period of time, and certainly by day’s end – even if it’s just a note to let you know I haven’t forgotten about you and will get to you shortly. Legal services can be expensive, but a client’s account can and should be managed efficiently. It kills me to constantly receive formal letters from opposing counsel – over matters that can be easily handled with a short email or quick phone call. Formal correspondence has a role; so does traditional legal procedure, but I am always mindful of how to best achieve your results in the most efficient manner. Over the course of a lengthy matter, a client can save a lot of hard earned money if the case is managed responsibly. I don’t want you to have a huge bill. I want you to feel as if you received high quality legal services for great value – so you will return and refer. If you need Smart Honest legal advice with respect to any of these areas I would be honored to be your go-to lawyer.